Yesterday, 01/22/19, on the 46th anniversary of the Roe v. Wade ruling, New York State enacted the Reproductive Health Act. 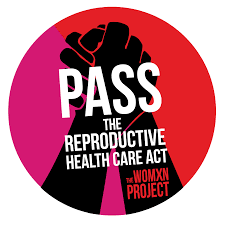 With the Reproductive Health Act now enacted, a woman’s right to make personal decisions about her own reproductive health will be protected in New York State — no matter what the federal government or the Supreme Court do in the future. Thanks to the great people of New York for respecting the woman's right to choose. Government has no place in telling a woman what to do with her body. Senator Ortt, in Western New York voted against this bill claiming he wants to save fetuses. As a Republican he is the first to curtail the safety net and other services but wants woman to produce children they don't or can't care for. Be carefull who you vote for. He represents Orleans County one of the poorest counties in New York State.